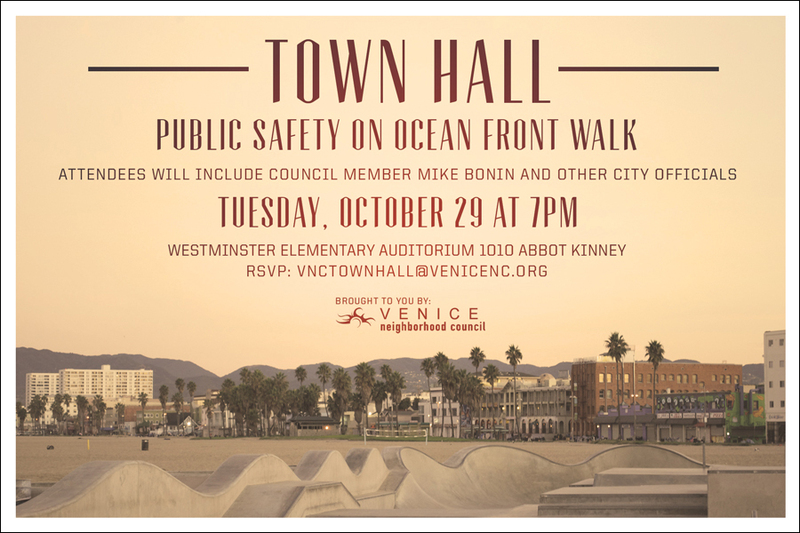 VNC 'Town Hall' on Ocean Front Walk Safety Issues: October 29th - Yo! Venice! – Is Ocean Front Walk the epicenter of violence and crime in Venice? – Has the transient population literally been allowed to take control of Ocean Front Walk due to long term Council Office indecisiveness? – Is the Council Office appeasing certain local corporations while putting resident safety at risk? – Is the LAPD turning a blind eye to “in your face” and repetitive Venice Boardwalk crime (it is a lot of paperwork), yet calling for tactical alerts and helicopter backup on a seemingly daily basis to have their egos stroked on LAPD “fan sites” that are not critical of their actions and inaction in Venice? The Venice Neighborhood Council will host a Town Hall meeting regarding “Public Safety on Ocan Front Walk” on Tuesday, October 29th starting at 7pm. The community is encouraged to attend and ask the powers that be to answer their questions. Attendees will include Councilman Mike Bonin, representatives from the LAPD and other City Officials. Click here to join the existing comment thread about this event.